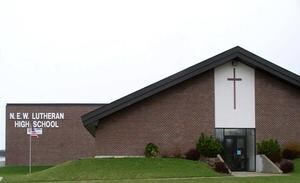 The seeds for the creation of Northeastern Wisconsin Lutheran High School were sown during the summer of 1975 when two couples were moved to determine the feasibility of starting a Lutheran high school in the Green Bay area. They conducted a survey which revealed sufficient interest in Christian secondary education. Out of a meeting at Pilgrim Lutheran Church, a steering committee was formed, and NEWLHS was on its way to becoming a reality! In 1977, we started out with 34 students while located at Pilgrim Lutheran School. Our school changed locations three other times before settling in at the current location on Green Bay's east side in 1993. NEW Lutheran High School has helped families prepare Christian leaders for the past 40 years, with many outstanding academic, athletic and artistic achievements taking place. The thing that our school takes the most pride in, however, is to see our alumni stay strong in their faith and engage the world as young Christian leaders regardless of their occupation. We are proud of the husbands, wives, parents, citizens and friends they have become. Seeing our mission of Helping Families Prepare Christian Leaders lived out is incredibly gratifying and humbling. To God be the glory for the opportunity to serve Him and the world in this way!